Participate if you can! You don’t need to be from New Brunswick to take part and any support is welcome. 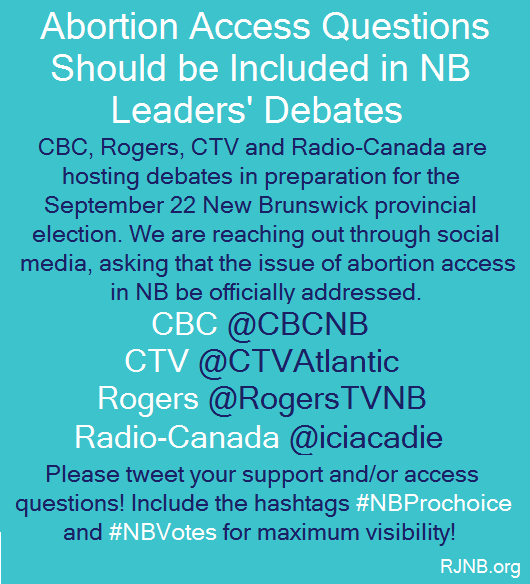 Lack of access in NB has become a huge election issue and it must be part of the official debates. Let’s make sure it is! The annual New Brunswick March For Life anti-choice rally took place on May 15th of this year, starting at the Legislative Building and continuing on down to the Women’s Care Centre which neighbours the closing Morgentaler Clinic in Fredericton (see CBC article here). So far we have counted and named twenty three New Brunswick MLAs in attendance at this rally, an alarming number to be sure, but let’s allow this to help us fuel our fight. We know what we’re up against, because they showed up in public to support the status quo. We have been writing, emailing and calling our representatives with little to no response. Twitter is a public avenue for these MLAs to connect with their citizens. Let’s see if they continue to ignore us. We have created a schedule that starts on Tuesday May 20th and continues each workday until we’ve run out of MLAs with active twitter accounts who were in attendance. 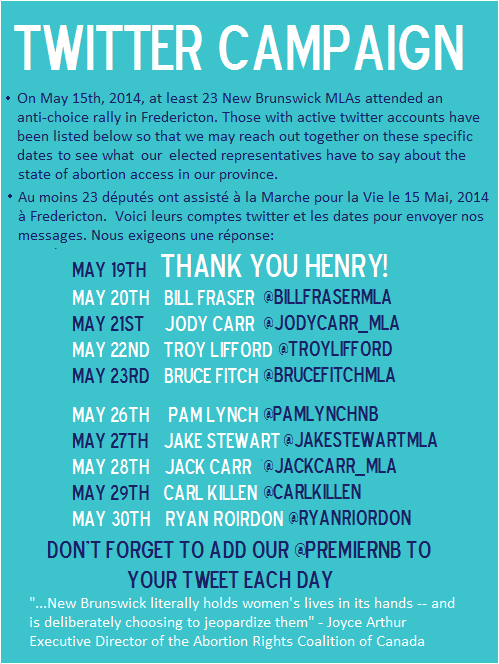 Don’t forget to add the premier @PremierNB to your tweet each day as well. “Hey @billfrasermla, I can make my own medical decisions! 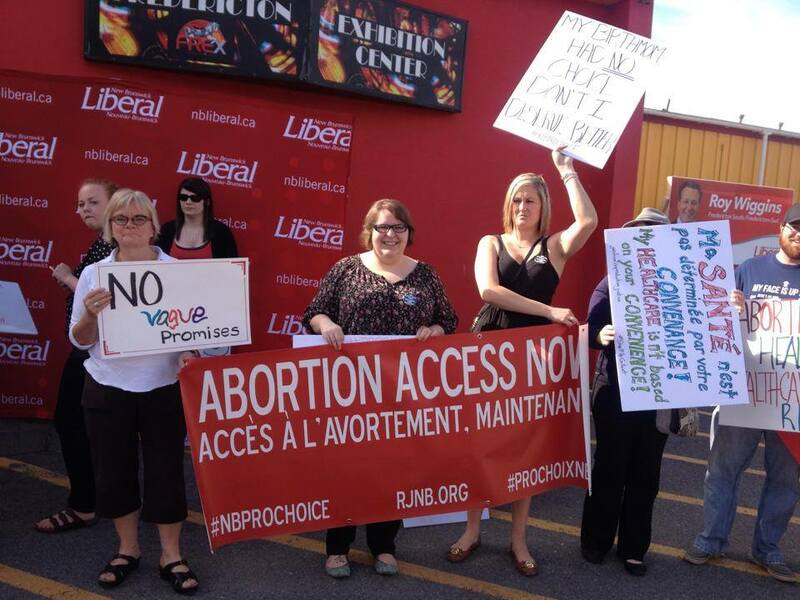 #NBProchoice”. Just keep in mind that Tweets addressed to someone (“@whoever followed by your statement”) get put in your “replies” and don’t get as many views! Let’s write messages, re-tweet each other, and keep it focused on law/politics. Every person deserves full, uncompromising autonomy over their own body. Regulation 84-20 endangers lives and infringes on our human rights. 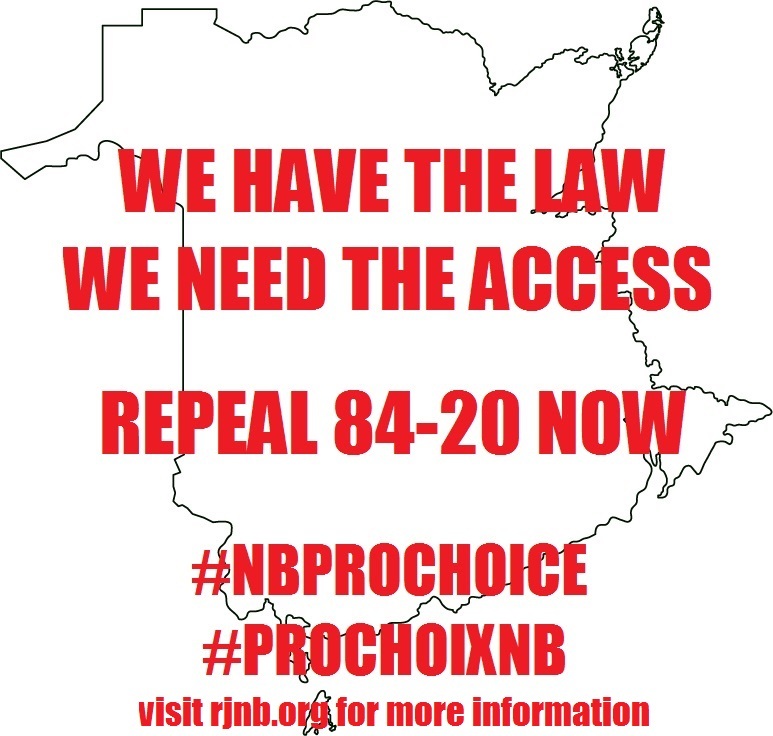 For a detailed history of this important issue, check out this piece by Professor Jula Hughes (UNB law), or this article by Joyce Arthur, Executive Director of the Abortion Rights Coalition of Canada. A national media outlet has approached Simone, the Director of the Fredericton Morgentaler Clinic, with a request for women to share their experiences accessing abortion services at the Fredericton Morgentaler Clinic. They have assured her that anyone doing so would remain anonymous, and only their stories and an anonymized picture would be used for an upcoming story. Simone and Kathleen, a member of ChoixNBChoice, are asking that anyone interested to contact them for a brief discussion before committing to be interviewed. This is obviously a sensitive subject, and we want to ensure that anyone volunteering has all the information about the process and is prepared for any questions that might arise. If interested, please email Simone at (506) 451-9060 or nbclinic@nb.aibn.com or Kathleen at Kathleen.m.pye1984@gmail.com. Legislative building, 706 Queen St.